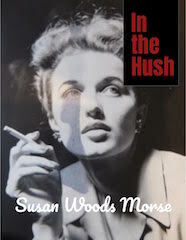 Susan Morse’s new collection, In the Hush, unfolds as a journey through relationships, nature, and time, with a sensibility to the harsh edges of the human condition. The persona woven through these poems doesn’t mince words. Titles such as “You Don’t Need to Keep Talking at Me, I Already Know You’re Going” combine with images of Alice in Wonderland’s “glass coffin of summer heat”. Morse’s nuanced, ever-changing landscape is compelling. The reader has no choice but to enter into “the consuming interests of the heart” and to grab hold of these deep mysteries rendered with clear-sighted acumen.